Create the next generation of developer tooling with our extensible platforms. Use your imagination to build services and tools that can be assembled into new IDEs or packages tailored to your identity. We provide multiple platforms to build plug-ins for desktop tools, distributed services used by cloud IDEs, and browser interfaces. You can then publish plug-ins to our Eclipse Marketplace of 1000s. 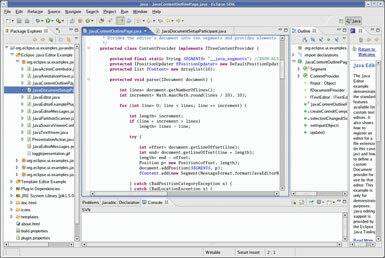 An impressive collection of tools can be easily installed into your Eclipse desktop IDE, including GUI builders and tools for modeling, charting and reporting, testing, and more. 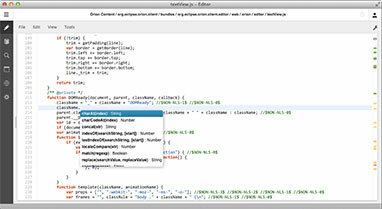 Customize and extend Eclipse and make it your own. Use the Eclipse Marketplace Client to find, install, and vote for new plug-ins from our vast ecosystem of providers. 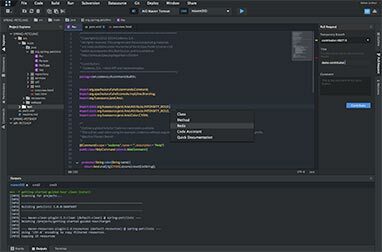 Extend the desktop and web-based IDEs by writing your own plug-ins using the Plug-in Development Environment (PDE), or mash up features to build the web IDE of your dreams.